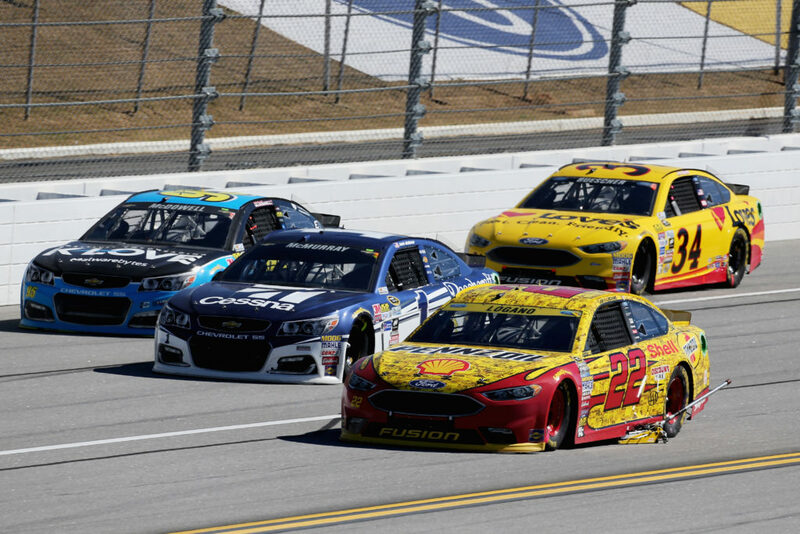 There was plenty of tension and anxiety running rampant in the pits Sunday afternoon at the Talladega SuperSpeedway for the running of the Hellman’s 500 NASCAR Sprint Cup event, the last race of three in the Chase of 12. Four competitors would see their season’s hopes fade away by sundown. 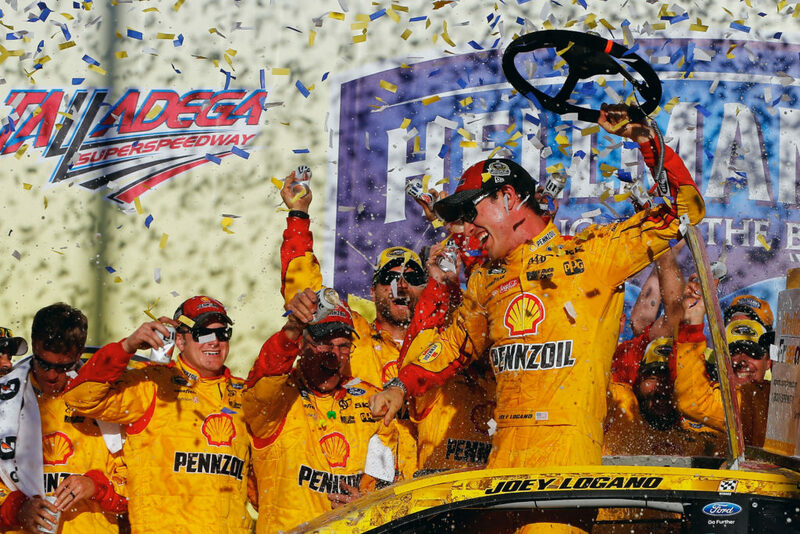 That certainly wasn’t the case for race winner Joey Logano and his Penske Racing Ford team, who felt running up front was the only place to be. That strategy paid off late in the race, despite some very difficult situations along the way that Joey had to overcome, needing a little luck along the way. His first obstacle was a green flag pit road miscue, dragging his jack the entire circumference of the 2.66-mile superspeedway on lap 40. He was fortunate right at that moment to have Martin Truex, Jr. bring out the yellow flag from the oil of his blown engine, bunching up the field and saving Logano from going a lap down. 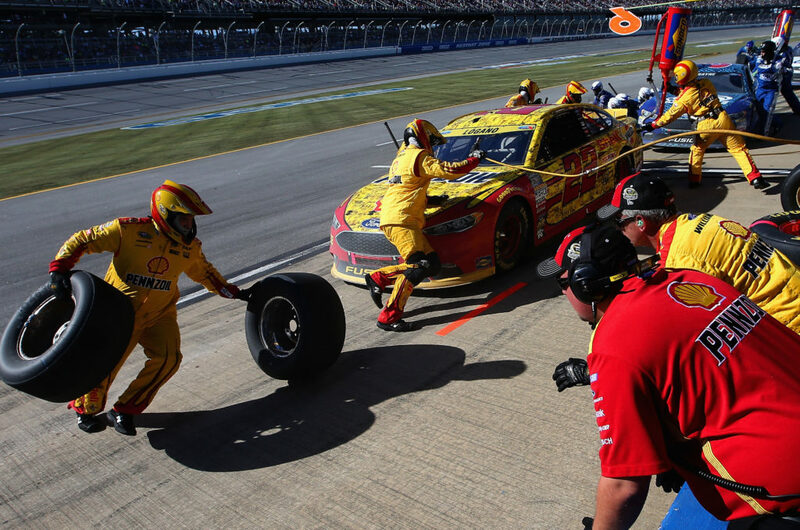 Later, Logano as the leader ended up collecting debris on his nose of his Ford, raising his engine temps to dangerous levels. He was saved by a late race caution to remove the blockage that sent the event into overtime for four extra laps. 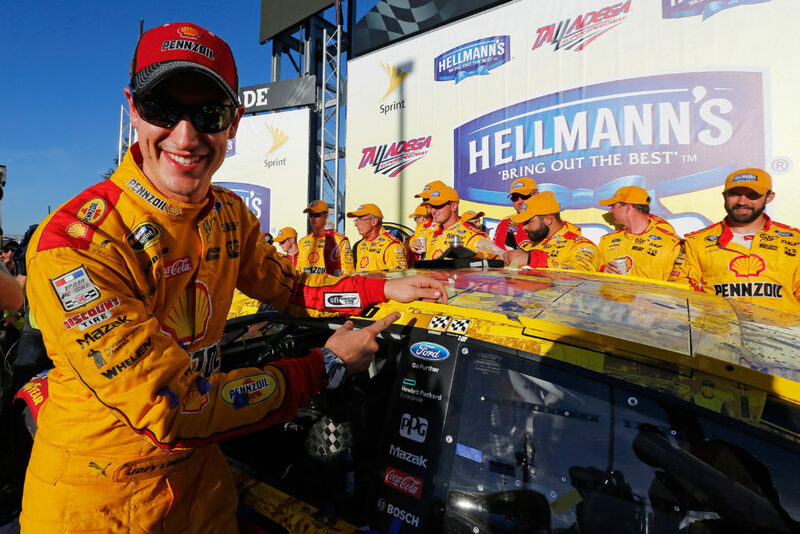 “It’s never a layup here at Talladega,” said Logano, winning for the second straight year at Talladega and 16th time of his young career. “It’s always close. You never get a big lead. (Crew chief) Todd (Gordon) made some good adjustments during the race and found some speed in the car, so that was pretty neat to see some of that. 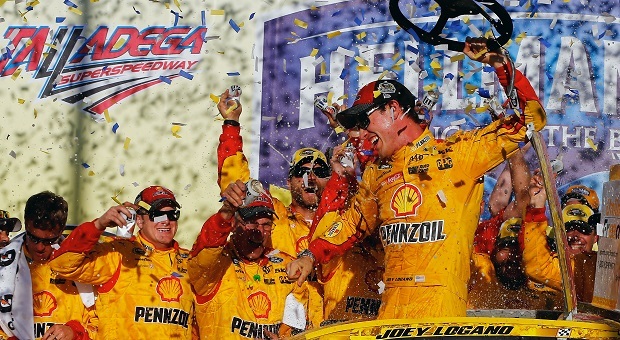 The top five were Logano, Brian Scott (with his career best finish), Denny Hamlin, Kurt Busch and Ricky Stenhouse, Jr. It was that jump to third at the finish for Hamlinthat enabled him to continue his Chase push, leaving Austin Dillon out. Hamlin and Dillon tied for the final spot in the Round of 8 with 3,078 points each. Hamlin won the tiebreaker on the strength of his third-place finish on Sunday as compared to Dillon’s sixth-place finish last weekend in Kansas. The eight drivers advancing are Jimmie Johnson, Joey Logano, Kevin Harvick, (each sharing a win in the Round of 12), those moving on from points, Kurt Busch +21; Matt Kenseth +10; Kyle Busch +6; Carl Edwards +4 and Hamlin as No. 8 contestant, with all drivers resetting to 4,000 points individually starting next weekend at Martinsville Speedway. “We needed some things to fall our way if we didn’t win the race,” Hamlin said. He beat Kurt Busch by .006 of a second for the pivotal position. “Today things fell our way. The last lap, we went out and earned it. 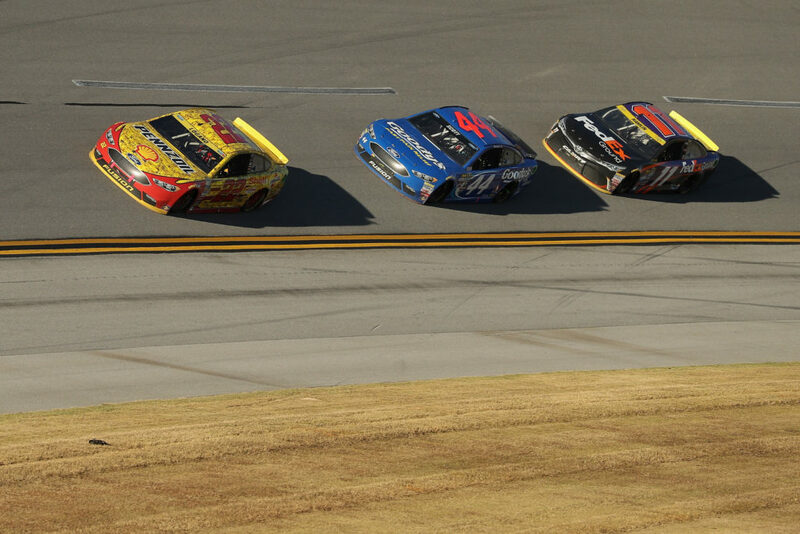 Those missing the cut were Austin Dillon (0), Martin Truex, Jr. (-18), rookie candidate, Chase Elliott (-28), and 2012 champ Brad Keselowski (-35) who lost his engine, posting a race leading 90 laps for the day. With a clean slate, the Chase of 8 starts next weekend at the Martinsville Speedway for the running of the Goody’s Fast Relief 500 on Sunday, Oct. 30, on NBCSN.